It's tough to really bemoan the fact when a person passes away at an advanced age like that, but when it comes to the last links to a bygone generation the pain is much greater, as is the loss. Reb Meir was the epitome of a Neveler Chossid who lived every single day with G-d, Torah, and Rebbe. There was no retiring at age 75, and he never felt that he had done enough already, even at that age. In America that concept is foreign to most people - I mean to American-born Jews - we tend to be content with what we've accomplished, unless it comes to making money. Lately the will to write hasn't been there for me, I guess you noticed. There were times when I had what to write about but couldn't find the time. At other times I couldn't compose myself and write. Now it seems like I'm just burned out. Maybe it's because the only time there's any "action" around here is when it's Snag vs. Lubavitch, or Satmar vs. Lubavitch etc. Otherwise it's dead city around these parts, at least as far as commenting is concerned. Now, if I was only after comments and such I'd do it all the time, and regurgitate the same old silly stories for you to chew on, but I have a conscience, believe it or not, and I won't stand for that. 100+ comments on a thread may make me feel good, but at what price? You wanna know pain? I'll show you pain. A local non-frum/maybe half-frum Jew walks into shul to say Kaddish. He seems like a somewhat affluent man, yet disheveled, like he hasn't slept or shaved for a few days. It turns out his dear wife of many years just passed away, and he's still in middle of Shivah. So the Rov tells him to sit down on a low chair, and that the people davening there will bless him for his recent loss. So, one by one he hears the "HaMokom" from everybody at the Minyan and thanks them for it, although he's not quite sure what it is they're saying. A Phenomenon like that is not something you see every day, but it sure does prepare you for what you might see outside of your local frum neighborhood these days. "Heysh'ke" Dubravsky speaks for most parents when he bemoans the fact that Lubavitcher Chinuch institutions charge as much as a blue-ribbon MO school that offers all the amenities you can think of without even coming close to that. There's also the fact that you'll be hard-pressed to find a family of Lubavitcher size in Mod Ortho circles, so that the expense is even less for the MO! When you say that Reb Yoilish's position versus "the Belzer , Lubavitcher, Gerer, Vishnitzer, Kloizenberger, or Boyaner position was maybe correct", you should really be a bit more specific. Whom it is that you're talking about? Is the "Lubavitcher Position" defined by Reb Mendele, Reb Yitzek or Reb Berish ? Because if you look at the latter's (and his son's) view on most issues at hand, maybe, just maybe, he would be just as vigilant, if not more so, about Zionism, Ivrit and other stuff that got watered down as years went by - and dollars started trickling in. Same goes for Ahavas Yisroel; Reb Sucher of Belz or even Reb Zalmen Halberstam's (Klausenberger Rov - HT) grandfathers - all Halberstams without exception, prior to him, had a way stiffer stand on Zionism, Ivrit and whatnot then Satmar ever did. From that point on, both Russian and Polish chassidus thrived on persistent warfare, disagreements and quarrels. There is nothing wrong with it - in fact, it's the sign of thing being done right, and so says Rashi on ויחן שם ישראל . But don't try to paint those idyllic unified derheibene Teishvei Nevel who never hurt a fly being corrupted by the evil Magyarosatmarsnagkhazaren who aren't even Jewish, (why are Hungarians so despised by all? - HT) and whose only concern in life is over how much Lieber's potato chips will Five Towns not consume this year because of the boycott. By the way, who is that individual whom Reb Mendel (The Rebbe - HT) calls a mechutzaf in Hisvaduyeis 5745 volume 4 pages 2227-2228 ? 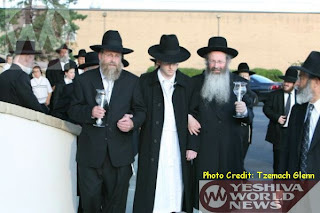 And by another way, do you know that some 95% of people under age 30 outside of Chabad - including Satmar and rest of "Poland" - have no idea that there ever was such a thing as boycott of their products; while most young Gezhe Anash (sometimes of Moroccan distillate) are still very vigilant about it? 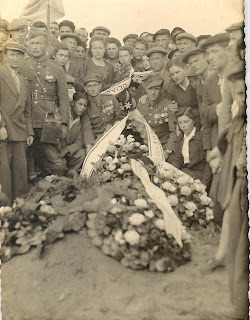 5701 - The entire male population of the town of Telshe, Lithuania, including the Rov and Rosh Yeshivah Reb Avrohom Yitzchok Bloch (1941), brother of Rav Eliyahu Meir Bloch and 2nd son of Rav Yosef Leib Bloch, and Yeshiva Bochurim, were marched out to the forest outside town and murdered by the Nazis with the help of their Lithuianian collaborators, neighbors, and supposed friends. (That's like the super of your apartment building today helping a local gang or invading military murder your family and then moves into your apartment.) The Yeshiva's end in Europe began in the summer of 1940, when the Soviets, who had occupied Lithuania, ordered the Yeshiva closed. 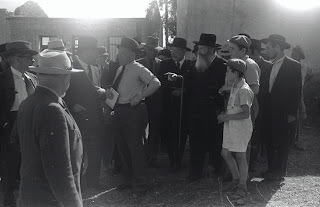 The Nazis entered the city on Rosh Chodesh Tammuz of 1941. After three terrible weeks of torture, on 20 Tammuz the Nazis massacred the male population of the city, including the Yeshiva's administration and student body. The women and children of Telshe were killed on 7 Elul. 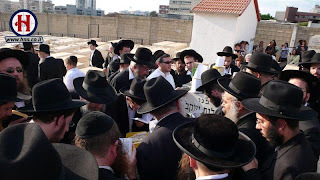 (With help from Yarzheit.com) The Telsher Yeshivos commemorate this day by having a special shmuess, and finish the summer Zman on this day, starting again on the 20th of Av, instead of Rosh Chodesh Elul like all others. 5751 - My maternal grandmother passed away on this day in her home in Brooklyn, New York. Born in Nirmada (Maad in Yiddish) A woman who lost her husband and child during WWII, she rebuilt after the war, and worked hard to raise a good frum family, all the while trying to make life as good as possible for others, especially her husband, children, and grandchildren. In her later years she suffered greatly at the hands of the dreaded Alzheimers' disease, but did it with great dignity. She was a true "Eishes Chover," making life for my Zeide, a true Chover, as good and as comfortable as possible, so that his learning can continue uninterrupted. 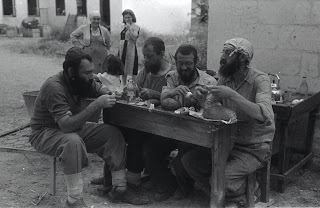 "Pioneers" in what was later to become Kfar Chabad, 1949. If you're tired of your drab daily life, here's what may be your big chance to start all over again. All for 50 Bucks! When it comes to Jewish sectarian violence Satmar takes the cake, hands down. Yes, some of will find random instances of violence by other groups, and much of it would be of the "intra-sect" variety, but in recent memory they are the standard bearers of that category. 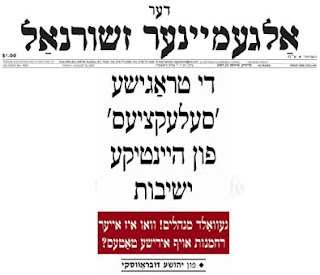 Yet for some reason, I guess since the Satmar Rov was so revered, the blame never reached the top, for the most part, unless you speak to your local Klausenberger, he'll tell you otherwise. 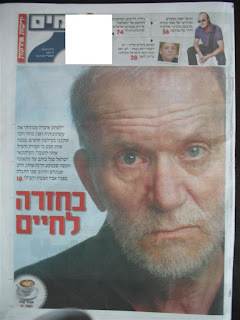 Even the secular Israeli papers eulogized him as a "lover of Israel and a hater of Medinat Israel," realizing that HIS was a distinctive love/hate relationship. So, the SR was able - by virtue of his total image - to escape the tab of sanctioning violence, even if all that violence was done to either protect him or to further his standing in a respective community. Do all Rebbes and Rabbonim get that kind of VIP treatment? definitely not. 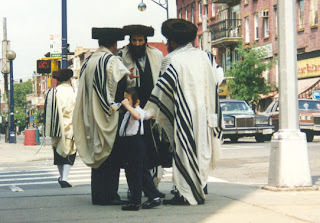 Why I remember a supposed "bombshell picture" of an old woman beaten and bruised, a daughter of a Chassidishe Rebbe, that was actually a fake, that was supposed to incriminate a Rebbe of condoning violence even though there never was that history amongst him or his Chassidim. Not only that, but even when his Chassidim were on the receiving end of violence not see since 1945 there too they were to blame, because they should've known. Why? just because the Rebbe wasn't liked by his (jealous) peers. To be fair: the late great Belzer Rov, who's Chassidim (and his father's) were know to be big Shleggers and who's tales of violent tirades often made it to the Yiddish press, also managed to escape the title of "condoning violence" by virtue of the fact that nobody could imagine him ever agreeing to such methods. The fact that Rebbes supposedly had Ruach HaKodesh, and definitely who was doing what at all times, notwithstanding. So, the lesson to be learned is this: if you're a Charedi Jewish group who has issues with a rival group you need to set yourself up as follows: You need to either terrorize the press into giving you good PR, so that all others will see you as a bunch of do-gooders, or build your reputation with good deeds to start. Then later on , when things get really hot and heavy, and you feel like you're losing control, use that large dose of good PR to beat the living daylights out of your rivals, thereby consolidating your power, all the while never having to answer for any of your violent actions. For those of you who've already been blacklisted, realize this: this line of reasoning may have a reverse affect. You may be accused - by the violent ones - of doing anything and everything - I mean the good deeds - solely for the PR and the money, while the violent ones will have thousands of good excused why they "NEEDED" to beat the daylights out of a father of 12. DISCLAIMER: The management of Circus Tent does not NECESSARILY agree with the opinions expressed here. I heard the Rebbe scream lo mehem velo mehamonum ,(by the way how many times did the Rebbe need to attack these people - once is not enough. I guess you are unaware of the boycott proclaimed against the CRC and their products etc etc.... By the way are you also defending the hate that the Satmar community spewed forth and still does against the Jews of Israel ?? 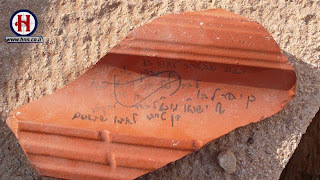 who was "meyhem?" 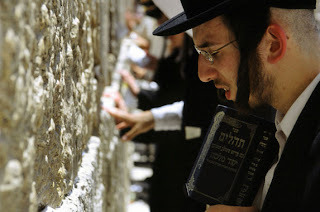 was it Rabbi JB Soloveitchik?, was it the Gerer Rebbe? 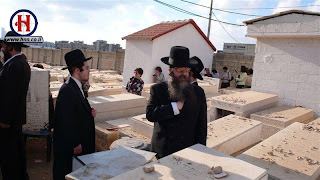 was it Rabbi Schneur Kotler?, was it the Vishnitzer Rebbe? No. 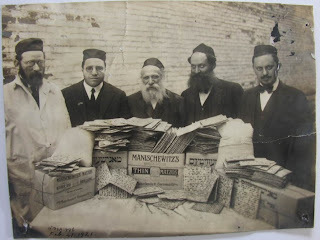 It was the Satmarer Rebbe and his Rabbinic noch shleppers who used every opportunity to attack Medinas Israel, the Klal Israel and Lubavitch, and preached a furious form of Sinas Israel against all who did not accept the shitah hakedashoh ( a shita whose newspaper mourned the downing of Syrian migs by Zahal with Kiddush levonna eysios. PLEASE TELL ME WHO THE REBBE MEANT BY "MEYHEM"!!!!! Don't even begin to rewrite history as if the 7th Rebbe had any shaychus (chutz mi derech eretz) to the shitto of satmar. Punkt farkert, he was the true Ohev Israel, ohev Medinas Israel, and sanigeyron shel Israel. Take a look at the book by the other Chaim Liberman DER REBBE UN DER SATAN and see the "maasim tovim" of that Rebbe and his followers. see what the Tzaddik Rav Yosef Eliyahu Henkin had to say about him and the heilike shitto. By the way the legacy of the Satmarer Rebbe is best seen in the community he left and their daily kiddush hashem in the media . I am fostering machlokes? Who was a baal machlokes in Hungary with his brother , with the Spinker Rebbe, With the Munkatcher with Reb Abishel of Krole, with the Tasnader Ruv with anyone who did not accept his hegemony? Who was the baal machlokes after the war with Belz, Kloizenberg, Vishnitz, the gedolim of the Aguda, with Lubavitch, and with anyone who dared resist the shittah and its creator. Lashon hora, you say? why not catch a BLIK at DER YID and DER BATT and see what true lashon horah against themselves and other Jews really is. I wonder if when the Avi HaKalloh Reb Malkiel Shlit"a signed on the wedding Takonos/guidelines put forth by the Agudah's MGT he meant himself too? or was there a clause in there that that pattered him? I wonder. I guess what they MEANT to do was save the shleppers from themselves and their selfish spouses who want to keep up wit the Jones's and make lavish weddings. Mah She'ein Kein, the Gedolim, who seem to have Teyreh U'Gedooleh BeMokeym Echod, they don't need any silly guidelines, the Torah guides them! Jewish learning is emerging as a powerful force in contemporary culture, fostering identity and unity among Jews. Yesterday’s challenge was to get people interested in Jewish learning. Today we must also find new and creative ways to service those that already are. Under the guidance of Rabbi Yaacov Haber, TorahLab is bringing together educational and media specialists to create dynamic learning experiences for adults of all backgrounds and levels. These outstanding programs, ideal for school curriculum and home study, form an exciting new approach to Jewish learning.. The TorahLab curriculum will present a comprehensive course of study for exploring the breadth and depth of Judaism. 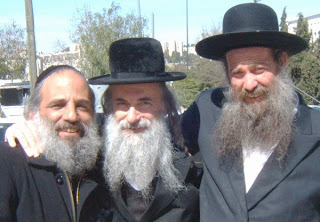 The founder and driving force behind TorahLab is Rabbi Yaacov Haber. 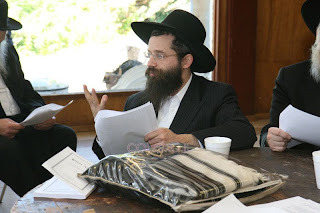 Rabbi Haber is an expert in adult Jewish education, and replaced Rabbi Berel Wein as the spiritual leader of Congregation Bais Torah in Monsey, NY. As the former National Director of Jewish Education for the Orthodox Union, he created the highly successful "Pardes Project." Rabbi Haber is the founder of the Australian Institute of Torah and the Torah Center of Buffalo. He is also one of the founding members of AJOP, the Association of Jewish Outreach Professionals. Rabbi Haber has published numerous articles and books and is a sought after international lecturer. Today is the 28th Yohrtzeit of the late Satmar Rov zt"l.
The Rebbe was deeply disturbed that he had actually offended the man with remarks that he had only meant as a friendly exchange. He begged his forgiveness again and again, as was his habit when he felt he had mistreated someone. Finally he asked him, “Please see me right after Yom Tov.” When the man reported to the Rebbe, he asked, “Why are you here? Why did you come to America?” “I’m here because I must raise five to six thousand dollars to marry off my daughter.” “I’ll get the money for you. And please - any children that you will be marrying off in the future - come here and I’ll take care of your financial needs.” The Satmar Rav was not satisfied until he had financed the weddings of the man’s four daughters. Most of you know by now that I've moved out of Brooklyn and moved to a suburban/rural community upstate. If you can't figure out where it is I'm talking about out then you're not a "Heimisher." One of the delights of this move, and the sunbsequent schedule changes imposed by it, is the fact that you get to daven on the bus every morning. Shacharis has a whole different meaning when it's done in bumper-to-bumper traffic on a grumbling bus, while trying to maintain your balance during Shemone Esrei when the driver makes a sharp turn into the Turnpike. There's also the fact that you need to basically remain seated from beginning to end - with some standing possible if you're in the aisle seat - but no roaming the shul from one end to the other. You also need to be there from beginning to end; there's no arriving at Ashrei and leaving after Shemone Esrei like some us are known to do when we daven at a "stationary" shul. The only problem is that if you're forced to sit in a window seat you're also forced to sit during the whole davenen, including Shemone Esrei and Kedushah. There's this one young man who davens on the bus who has a real geshmak in davenen. I mean that he sings the L-rd's praises as if he was just granted life all over again, which we all are. He utters every word clearly and meticulously, and has a nice tune to it as well. Like the old Yiddish-Teitsch Siddur says: M' darf davenen gelassen punkt vee m'tzeilt gelt. The only problem is that the rest of the minyan is a bit quicker than him, and he always is way behind the minyan come Shema or Shemone Esrei. 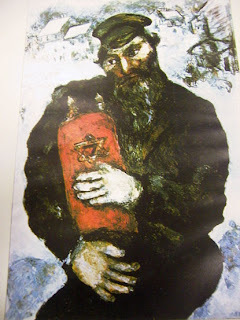 So, our young man, who's also very careful about davenen with a minyan, skips most of Pesukei DeZimroh and rushes ahead to Birchos Krias Shema. He davens Shemone Esrei with the minyan and then proceeds to finish up what he missed after he finishes the back end, including Oleinu. This is not a one-time oiccurence; but rather a daily ritual. All this seems like somewhat of a paradox to me, although he's seemingly doing the "right thing." It seems to me, and this is apparently the Chassidic approach, that davenen is more than just fulfilling your Shulchan Aruch obligations. Yes, we have an obligation to stick to the rules of davenen, but we also need to examine the Milsah BeTa'amoh that is so inherent in davenen. You can be Yotzeh the Hilchos Davenen daily by skipping to the end every day, but what kind of davenen is that? Is it ok to LeKatchilloh do this every single day? 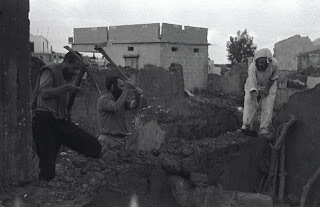 What I've seen over the years from Yidden Yerei Shomayim BeTachlis is that davenen needs to be done just the same no matter what, from the beginning and in the order it was made to be done. (with the possible exception of Hallel) If you arrive to shul when the Minyan is halfway done you don't skip ahead, but rather you daven just as if you were the first to arrive, from the very beginning. Otherwise it may be a body of Tefillos, but it has no "hent un fis." My only question is now: do I - in the spirit of Ahavas Yisroel - approach him, since he is an old friend, and tell him what I think about his daily routine, thus helping to make him a better person, or do I MMOB and let him enjoy his blissful existence? 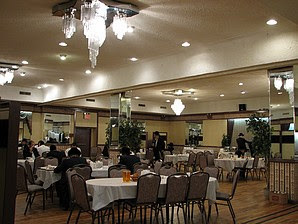 "Every man needs a home-cooked meal at the end of the day," said diner Yosef Podrigal. The only problem, he said, is that the service "makes you miss your wife less." 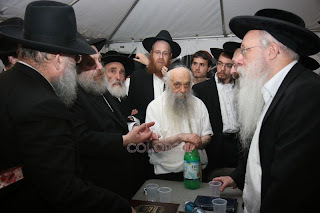 Reader commenting on Circus Tent: Motzoei Shabbos Melave Malka Manischewitz Matzos: The old Rav in the center is Rav Avrohom Aharon Yudelovitch z"l. At his right is Rav Mordechai Aharon Kaplan z"l, who was Rov in various Shuls in Brooklyn and Manhattan. Rabbi Avrohom Aharon Yudelovitch was born in Navarodik, Russia in 1850. 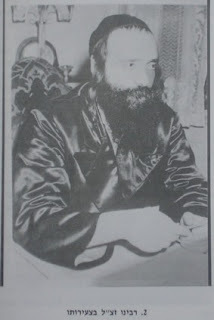 At age 21 he authored his first book "Alim L'Mivchan." He received Semicha from Rabbi Yom Tov Lippman of Bialystock, Poland. Rabbi Yudelovitch left for Manchester, England, in 1898 where he became Chief Rabbi. In 1904 he arrived in the United States. He published many seforim: Beis Av (5 volumes), Darash Av (5 volumes), Av Bechachma and others. In addition, he co-published a Journal in 1910 with Rabbi Jacob Eskolski called "Hamitzpeh". 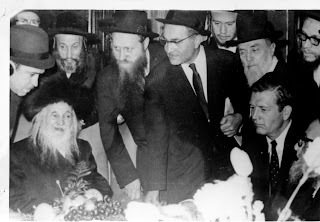 Rabbi Yudelovitch passed away on the 5th of Shevat, 1930. He was survived by his wife Rose, 3 sons and a daughter. Today is the Steipler's 22nd Yohrtzeit, if my memory serves me right. He was Rav Yaakov Yisroel Kanievski, son of a Hornosteipler Chossid, who later learned in Novardhok and adopted their ways. He married the sister of the Chazon Ish. On this day thousands of people - many of whom that say that spending time at a Kever is "Doresh el HaMeysim" - prayed at the site, asking G-d to grant them health, wealth, and time to enjoy them, all in the merit of the righteous ones that are interred here. In my very humble opinion Yarchei Kallah in Lubavitcher Camp Gan Yisroel is the nicest gathering that exists in Lubavitch today. Yes, there are times when thousands of Chassidim gather together at more auspicious times, and there are times when more of the mainstream and laymen are involved, but this to me is special. It's a time when the leaders of Lubavitch, the ones that are responsible for the future of Lubavitch, meet to see what can can be done to further improve the products that Lubavitch produces. It's a meeting sans politics, ego-trips, and tales of great success in their towns and cities. Just good ol' fashioned Torah learning - in all fields of Torah - for 4-5 days. The Kinus HaShluchim is nice, and it highlights the efforts Lubavitch makes in the field of reaching out, but there would be no outreach without the Rabbonim and Roshei Yeshivah. It also allows for the young'uns in camp, especially those from parts unknown (out-of-town בלע"ז) to see a true Ritchoh De'Oraysoh in a Chassidisher Oyfen. (my apologies to shturem.net for not including links to their great galleries, I just didn't have the strength for more copy and paste of links. 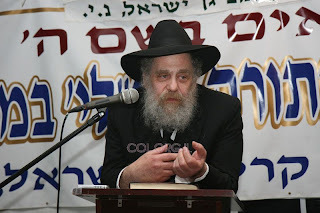 The late Belzer Rov (Yohrtzeit 21 Av) was probably the last of the "undisputed Tzaddikim." By that I mean that even the biggest Misnagdishe Mechutzef wouldn't dare open his mouth against him, and even the Satmar Rov, who had no problem disagreeing with Rishonim, very much wanted to win over the BR when it came to setting policy regarding the Charedi approach to the Government in Israel. It didn't bother him what the Roshei Yeshivah and other Rebbes at the time decided, it was the BR that was the stickler for him. He traveled to the Holy Land to try and change the BR's mind, but to no avail. 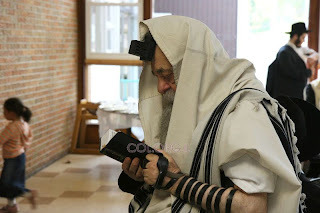 He considered his trip as a failure of sorts, since that was ultimately the goal of the visit, the visits with Chassidim and the Droshos against voting in the elections were secondary. What was there to dispute you may ask? According to me nothing at all, but some of the "defenders of the faith" in the Yeshivisher world surely would've had a problem - KeVayochol - with many of his Hanhogos. Yet, for some reason they dared not open their mouths, at least not publicly. It may depress some of you that we've lived for fifty years without a replacement of that stature, and we'll live for another fifty for sure without seeing another one. But look at the bright side; it can only mean one thing: Moshiach will either come very soon, or the world will come to it's end. Either way we'll go to a better place. I sometimes wonder, no, often wonder, why I continue with this blog. I know it won't go on forever, yet I continue as if there's an unknown force that compels me to continue. Maybe there's a need for it as long as there are others that take the other side. 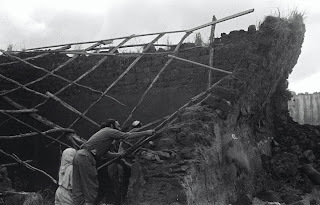 They say that when Olomeinu was about to go under due to a lack of funds the Rebbe made a very, very large contribution to get it back on it's feet. 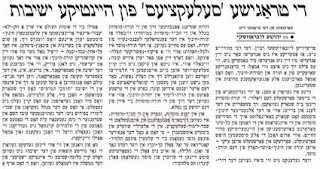 Yes, the Lubavitcher Rebbe saved one of the only frum publications for Jewish youth that was supposedly run by his "adversaries," the leadership of Torah Umesorah. The reasoning was as follows: There was another publication, published by MO-Mizrachi circles, that had a similar format, and attracted the same readership. Obviously it had a different slant, one somewhat foreign to frum, Charedi kids, and that would've been the only one left. The Rebbe is said to have said then: "As long as there's the other publication there needs to be an Olomeinu to counter it." That doesn't mean that it didn't have an intrinsic value as well; it most certainly did. But were it to go down it wouldn't be as bad if there wasn't the other magazine to fill the void. Efsher ken men zoggen that we too serve a similar purpose here. Recently we may have slacked off due to personal reasons and lack of time and energy available, but we realize the need to push along as long as the others are still out there filling the world wide web with hate and pure gibberish. Anyway, Nadler takes issue with Feldman and much of what he said, and although I never cared for Nadler I can see that he makes sense. One of the lessons I've learned from blogging is that I can listen and tolerate other opinions which I may disagree with, and I can separate the opinion from the person. So now I can accept Nadler's words for what they're worth, but I needn't agree with his Left-Wing politics. I especially enjoyed where he speaks of the Novardokker Mashgiach and his words to Chaim Grade before he left the Yeshivah to "frei out." Similar verbage and terminology is used in Chabad about not enjoying Tayves and Aveiros, and I can see how people compare Chabad to Novardok. Yisrael Segal is a prominent Israeli journalist and broadcaster. To say that he dislikes Charedim is an undertstatement. He's part of the Ashkenazi elite that would rather there be no frum Jews in Israel. 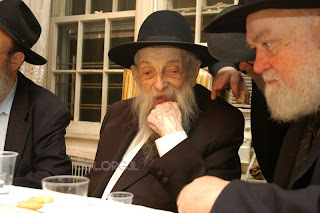 He's also the brother of Reb Don Segal, the former Mashgiach of Ponovezh, and now known as the Mashgiach sans Yeshivah. 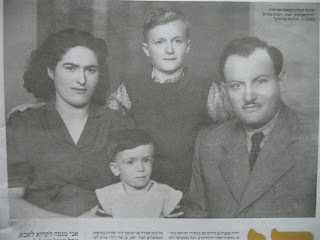 Yisrael was born to a Frum family - although his mother today would be considered MO - but left the fold. He's spoken many times how he was shunned by his family after Frei'ing out, and how his brother has never spoken to him since. He also speaks here of his father's Levayah, and how then and and at the Shivah he was ignored by them. I guess he yearns for his family's love and acceptance after all. Don't we all. Recently Yisrael was in a major car accident where he came inches from death. 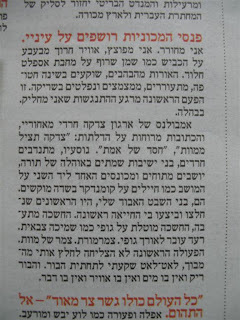 In this article he speaks of the fact that frum volunteers of Zaka (the Israeli recovery team made famous from cleaning up and responding to all those Terrorist Bus bombings and attacks) and the Chevrah Kadisha were at the scene - presumably expecting him to die - and frum Hatzolah responders as well. That's all he sees, not people who tried to save his life, but frum people, people he hates. He's all better now and was recently interviewed in the Israeli and spoke of his troubles with his family etc. In a way we're all like that; I sure am. We see ourselves as members of a group, and all others as outsiders, although we may have alot in common and are members of a greater group. We like our group and maybe tolerate the others, with tolerate being the key word here. So I guess we're not so different after all, us and the Yisrael Segals of the world.